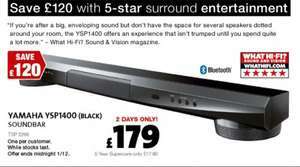 2 day deal from today, great soundbar. Think I will be purchasing this! Thanks! Tempted, how does it compare to a sound bar and separate sub such as Samsung HW-H355? No Hdmi In on this, bought it anyway at this price. Have all hdmi devices connected to tv and optical from TV to soundbar. Tv won't pass through DD5.1! Converts it to stereo, 90% of tvs do the same. All my devices are hdmi, e.g. chromecast. Any ideas? You don't vote on the specific of missing hdmi. You vote on the deal. Seeing as it has £120 off I've votes hot. If you can find a simular yamaha sound bar with sub and hdmi for less then why not contribute to the site and post it? You don't vote on the specific of missing hdmi. You vote on the deal. … You don't vote on the specific of missing hdmi. You vote on the deal. Seeing as it has £120 off I've voted hot. If you can find a simular yamaha sound bar with hdmi for less then why not contribute to the site and post it? Hot for the price reduction and was tempted. Reading actual punters thoughts of their purchase, don't think it lives up to the hype of the 'expert's' reviews etc so will be giving it a miss.. Owned one Yamaha sound bar previously. The sound is relay fantastic but without HDMI this unit should cost £20 to be hot. The remote control paring is NOT working brilliant. So that's I voted NO. Buy tape recorder and connect it to your telly. Got this avoid running surround sound wires in new house. Great sound but don't expect it to be 'surround'. I'd class it more of 3.1. Got it linked via Bluetooth to iPhone - great for music and there's a Yamaha app so that the bar can be controlled off the phone too. HDMI totally not needed, just use the optical or coaxial from the back of the TV into this, those are still high quality digital signals. I have 3 HDMIs on my soundbar (2 in, 1 out with arc) all of which are unused as I don't have arc on the tv and don't want to have to run many thick HDMI cables to the soundbar. Bluetooth is a great addition. I have a Philips HTL5120 which gets great reviews without a dedicated sub so it shows you don't need one for decent sound. The bass is fine for movies and music assuming you don't want it sofa rumbling (which I don't as I live in a terraced house). Yamaha have a very good reputation for soundbars and if this had been this price when I was buying I would've got this instead. The Phillips is a very good alternative if you want a subless soundbar and must have HDMI. Any idea how it compare to a Sonos Playbar?! HDMI totally not needed, just use the optical or coaxial from the back of … HDMI totally not needed, just use the optical or coaxial from the back of the TV into this, those are still high quality digital signals. I have 3 HDMIs on my soundbar (2 in, 1 out with arc) all of which are unused as I don't have arc on the tv and don't want to have to run many thick HDMI cables to the soundbar. Bluetooth is a great addition. I have a Philips HTL5120 which gets great reviews without a dedicated sub so it shows you don't need one for decent sound. The bass is fine for movies and music assuming you don't want it sofa rumbling (which I don't as I live in a terraced house). http://www.trustedreviews.com/philips-htl5120-reviewYamaha have a very good reputation for soundbars and if this had been this price when I was buying I would've got this instead. The Phillips is a very good alternative if you want a subless soundbar and must have HDMI. I'm using the optical from the back on the TV, but issue is that TVs don't pass through DD5.1 or DTS etc. It gets converted to stereo. I assume the YSP-1400 will use a 5.1 signal differently than a stereo one, e.g. it might try to bounce the 5.1 signal around the room? Been toying with buying that for a few weeks. Missed it when it was at £149 sadly. I'm using the optical from the back on the TV, but issue is that TVs … I'm using the optical from the back on the TV, but issue is that TVs don't pass through DD5.1 or DTS etc. It gets converted to stereo. I assume the YSP-1400 will use a 5.1 signal differently than a stereo one, e.g. it might try to bounce the 5.1 signal around the room? That certainly is the downside, but I've never been convinced by 'virtual' surround sound anyway. I always leave that kind of thing switched off because to me it always sounds worse. I think if you wanted to hear things coming from behind you, you'd put speakers behind you and spend money on a proper DTS amp! I've been looking for decent soundbar with built in subwoofer as the wife will not let me have ungainly speakers dotted around 'her' living room. Hi all, does anybody know the difference between this and the YAS-103? Going to pick it up from RS today. I will tell you how it goes tomorrow. My "understanding" is that the 1400 is much "better" as it is a sound projector with Yamahas Beam technology, I have read that the YAS103 is more or less just a speaker in a box. Soundwise though I have no idea. My "understanding" is that the 1400 is much "better" as it is a sound … My "understanding" is that the 1400 is much "better" as it is a sound projector with Yamahas Beam technology, I have read that the YAS103 is more or less just a speaker in a box. Soundwise though I have no idea. Thanks Sternakin, I have gone for the YSP1400 :)Thanks OP also! would this be better than my Denon ht100? Was looking at this earlier and just went on to buy it and it's up to £269! Would have thought deal would be on until midnight!!! Emailed Richer to see if they will honour deal price since they are still advertising Black Friday deals on their homepage but have sneaked this price back up! thought this was a 2 day deal? it's back up to £269 it literally changed whilst I was reading the the reviews/specs on their website! Was looking at this earlier and just went on to buy it and it's up to … Was looking at this earlier and just went on to buy it and it's up to £269! Would have thought deal would be on until midnight!!! Ditto. Very disappointed. Lets hope we can get one at the discounted price. Anyone got this and know the 'best' settings to use. Yeah I have this and have been playing about with it a couple of days. I'm pretty impressed so far and happy with the price I paid. I think a lot will depend on the room size and TV position etc. I would def recommend downloading the app and connecting it via bluetooth. It gives you extra functionality in terms of programming the soundbar with your position in the room, and you can change the room dimensions too. Run the test tone from the app to see how the tone from each individual 'speaker' sounds. I was surprised to hear the rear right tone was actually behind me when using the test tone so it was bouncing something. I seem to prefer the "Movie" setting over the rest, although the TV one wasn't bad. I have also turned on the "clear voice" setting as I like the centre speaker to be a little louder. Although you can adjust the volume of each speaker too. Best to play about with it but MI:3 was on Sky yesterday and it sounded pretty good to me! Deal posting newbie! This is gazbat first deal post. Help out by leaving a posting tip or just to show your appreciation for their contribution.